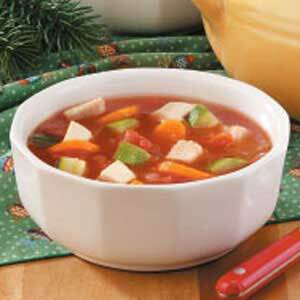 A simple vegetable soup is one of the quickest and healthiest things that you can prepare for lunch. It can also be surprisingly tasty and has therefore quickly grown to become one of my favorite lunches. Before we get to the recipe though, I’d like to spend a few words on the impact that cooking has on vegetables. Prolonged exposure to very high temperatures (such as frying in oil) can destroy many nutrients, but shorter cooking at lower temperatures (such as boiling or steaming) can actually make the vegetables more digestible and enhance health benefits. 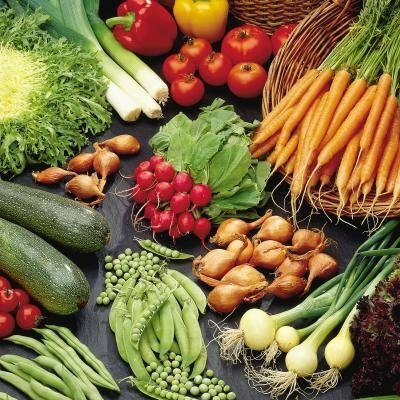 In addition, nutrients such as water soluble vitamins can leach out of the vegetables during cooking. When considering these facts, a vegetable soup is indeed a very healthy choice. Temperatures do not rise above 100 degrees Centigrade and cooking does not need to last for more than 10-15 minutes. In addition, all the vitamins that leach out into the water are eaten with the soup, so that is no problem at all. You really win all the way. Put a pot with some water on a hot stove plate. While the water is heating up, slice up your favorite vegetables. You are really free to use whatever vegetable you want in whichever quantities you want. I mostly use green beans (for some protein), mushrooms (simply because of their awesome taste), sweet potatoes (because they are much healthier and tastier than normal potatoes), carrots (because they add some nice color to the soup) and onions (for flavor and health). As you finish chopping the vegetables, add them directly to the pot and keep filling up the water level to keep it just on the same level as the vegetables. The order in which you add the vegetables does not matter. By the time you finish the chopping process, the water should be close to boiling. Add a few blocks of dried low-salt chicken or vegetable bouillon/broth/stock and olive oil to bring out the taste. When the pot begins boiling, put on the lid and reduce the heat to just keep the pot at a gentle boil. Set the timer for 10 minutes. After these 10 minutes of boiling, use a fork to see if the vegetables are soft and take a few taste tests. Add any additional flavoring that might be necessary. I usually make a big pot that gives me six lunches – one of which I eat right away and five of which I freeze for heating and eating at a later stage. I also always have a slice or two of whole wheat bread on the side to dip in the soup. It really tastes great and adds some more protein to your lunch. I make a big pot of soup or beans almost every weekend to eat for lunches. It’s very satisfying and quick to heat up. Usually serve it with a small salad on the side. Thanks Arlene 🙂 Yes, this is very practical, versatile, healthy and tasty (a pretty decent combination) and I wish that more people could take a little bit of time to learn such recipes. Miracles do happen … 🙂 This is the child who became pale (and sometimes a bit aggressive) when you presented him with a plate of veggies! Absolutely fantastic. Thank you for sharing your recipe.